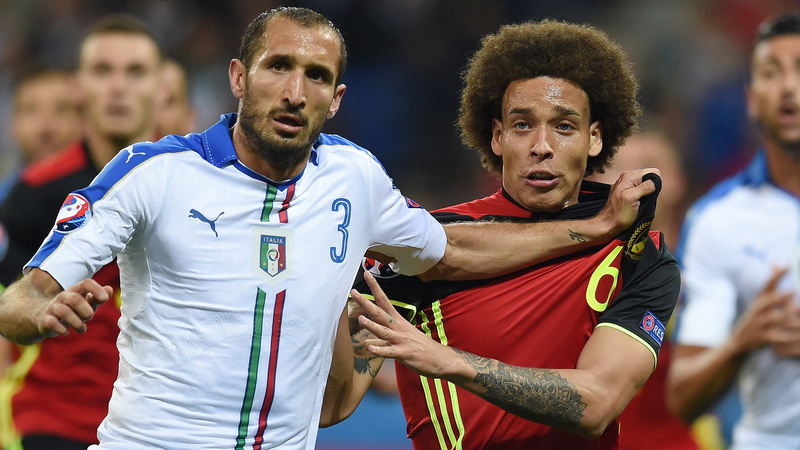 Italy sprung a surprise in Group E by beating Belgium as Euro 2016's highest-ranked nation fell to a 2-0 loss in Lyon. Marc Wilmots' side, who sit second in the FIFA rankings, had been considered by many as favourites to prevail in France, but they have work to do following Monday's damaging defeat. Emanuele Giaccherini opened the scoring with a superb two-touch finish following a stunning pass from Leonardo Bonucci. Italy should have been two up before the break, but an unmarked Graziano Pelle contrived to send a close-range header wide. Belgium – in their first appearance at the Euros since co-hosting the tournament in 2000 – spurned a glorious chance to make Antonio Conte's men pay when Romelu Lukaku squandered a one-on-one opportunity in the 53rd minute, with Thibaut Courtois denying Pelle a couple of minutes later. Wilmots sent on Dries Mertens and Divock Origi – the latter for a disappointing Lukaku – during a second half in which Belgium showed substantially more promise, only for Pelle to volley a second on the break deep into stoppage time. Belgium sit bottom of the group following Republic of Ireland's 1-1 draw with Sweden. Radja Nainggolan tested Gianluigi Buffon with an early long-range drive that the veteran goalkeeper pushed away from his left-hand upright. The Roma midfielder was off target with another drive in the 22nd minute, before Belgium began to cede the initiative. Pelle's curling effort had Courtois diving to his left at the other end and the Chelsea shot-stopper was relieved to see it end up behind his goal. But the deadlock was broken just past the half-hour mark when Bonucci lofted a perfectly weighted pass from his own half onto the toes of Giaccherini, who controlled and guided a nerveless finish past Courtois. The Belgium keeper was called into action soon after when Antonio Candreva stung his palms from 20 yards, while Pelle somehow missed with a simple header from eight yards. Kevin De Bruyne was twice frustrated by some typically assiduous Italy defending as he sought to wipe out the deficit, with Conte's men soaking up what little pressure was being applied. Buffon was late to emerge for the second half, but found himself thrust into the action eight minutes after the restart when Lukaku raced through on goal before sending his shot over the onrushing Juventus stalwart and wide. It was a poor miss that could have been made to look even more costly had Courtois not brilliantly thwarted Pelle with a fine one-handed stop a few moments later. Lukaku was withdrawn for the final 18 minutes as Origi got his chance, while Italy resorted to some heavy-handed defending to stifle Belgium, accruing a clutch of late yellow cards in the process. Origi wasted two late headed chances and saw Pelle cap a swift counter-attack with a volleyed finish as an over-stretched Belgium were consigned to an opening-game loss.